Stubborn strength, toil, endurance, placidity, manifestation, explanation, teaching, goodness of heart, help from superiors, patience, organization, peace. The letter Vau means a "Nail". It is used as a symbol of the phallus. This usage is confirmed by the Zodiacal sign of The Bull, which, as already pointed out, is a glyph of the universal reproductive force. 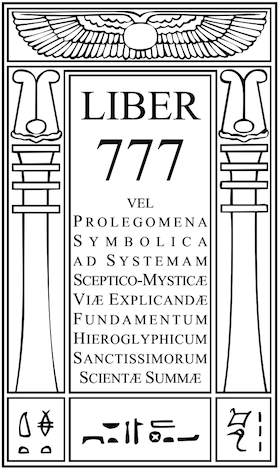 The phallus, in the mysticism of the Qabalah, is a creative symbol of a creative reality, the magical will. As an aid to the comprehension of this idea I quote from Jung's Psychology of the Unconscious for a definition: "The phallus is a being which moves without limbs, which sees without eyes, which knows the future; and as symbolic representative of the universal creative power existent everywhere immortality is vindicated in it. It is a seer, an artist, and a worker of miracles." This definition is particularly appropriate to the Chiah, of which the lingam is the terrestrial symbol as well as vehicle. The attributions follow the astrological one very closely, for we find here the Egyptian Asar Ameshet Apis, the fighting bull of Memphis, who trampled on his enemies. The Orphic congregations at certain of their holiest secret convocations solemnly partook of the blood of a bull, according to Murray, which bull was, by some mystery, the blood of Dionysius-Zagreus himself, the" Bull of God" slain in sacrifice for the purification of man. And the Maenads of poetry and mythology, among more beautiful proofs of their superhuman character, have always to tear bulls in pieces and taste of the blood. The reader will also recall to mind the fair promise of Lord Dunsany's most interesting story, The Blessing of Pan. In India we see the sacred bull revered as typifying Shiva in his creative aspect; also as glyphed in their temples by an erect Lingam. Here, the Goddess of Marriage, and Hymen, the god carrying the nuptial veil, are also correspondences. 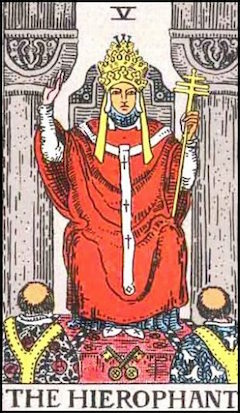 V - The Hierophant is the Tarot attribution. He is represented as raising his right hand in the sign of benediction over the heads of two ministers, and in his left hand he bears a wand or sacerdotal staff surmounted by a triple cross. At his feet are two keys, those of Life and Death, which solve the mysteries of existence. Vau is also the" Son" of Tetragrammaton - Bacchus or Christ in Olympus (Heaven) saving the world. It also represents Parsival as the King-Priest in Montsalvat celebrating the miracle of redemption. The name Bacchus is a derivative from a Greek root meaning "a wand". Together with his many names of Bromios, Zagreus, and Sabazios, he has many shapes, especially - so says Prof. Gilbert Murray - appearing asa Bull and a Serpent. Many of the correspondences of Tiphareth, the sixth Sephirah, have a close connection with this sixteenth Path, Adonis, Tammuz, Mithras, and Attis are further allocations. Storax is the perfume, Mallow the plant, and Topaz its jewel. Indigo is the colour of this Path. A man of like figure (to the ascendant), with cloven hoofs like an ox. The Magus of the Eternal.